Find Talass in Ivory Tower 3f to start the quest. He warns you of an evil which could bring disaster to Aden, however, there is a Mysterious Rock located in the Forest of Mirrors which can help you stop the disaster. He asks for you to show him a Record of the Ancient Devil, which signifies your understanding of the disaster. In the Forest of Mirror, you need to find an NPC. He tells you that he was cursed by the elves and that he knows how to put the disaster to sleep. However, he doesn't like being a rock, so he asks for Spellbook (Cancel Magic) so he can cancel himself. He also needs the regurgitation of a Doppleganger for the disaster. In the Forest of Mirror, there is one special Doppleganger which when fed a Bless of Eva, will give you Doppleganger Regurgitation. Find and kill this Doppleganger, but feed him a Bless of Eva first. Once you give the Spellbook (Cancel Magic) and Doppleganger Regurgitation to the Mysterious Rock, he will give you the Record of the Ancient Devil. 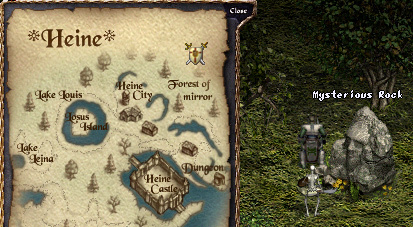 Lands of Aden server: On the Lands of Aden server, Spellbook (Cancel Magic) is not a requirement, instead you need to get an Ancient Magic Crystal one of two ways: (1) Take a Spellbook (Cancel Magic) to Orim on the 6th floor of Mainland Caves and he will trade it with you fro an Ancient Magic Crystal or (2) kill the Ancient Demon on the 4th floor of the Tower of Insolence. Take the Record of the Ancient Devil back to Talass. Talass will give you a Magic Bag of Talass. Double-click on the Magic Bag of Talass. You will get a Cloak of Mana and a Wisdom of the Ancient People. The Cloak of Mana is -2 AC, Weight 10, Material: Cloth, Wizard Only and +5 MP per tick. The Wisdom of the Ancient People is "something that will definitely be needed later and is an item that dominated something ancient." Special thanks to Sesame for identifying the locations of the rock and Doppleganger spawn. amer: The easiest way to kill the Doppelganger is to hand him the Bless of Eva then cast Curse: Paralyze on him. Also, it helps to have friends around who will keep other Doppelgangers off of you while you fight the special Doppleganger.